Flea Market Outdoor/Indoor, Rain or Shine! Come out for Tecumseh Trade Center's 14th year running and one of the largest Flea markets in the state. We are next to Meyers Divers Airport and Skydive Tecumseh. Enjoy the scenic drive along US 12 or M50 that leads to the Irish Hills. We are less than a few miles from either highway between Tecumseh and Clinton. Shop within our 2 large red barns that each are 15,000 sq ft and the wide variety of outside vendors. On any given weekend you will find deals on all types of household goods, tools, lawn mowers, glass, collectibles, lighting, antiques, vinyl records,toys, friendly faces... the list goes on and on. "If someone here doesn't have it or can't get it, they didn't make it!" 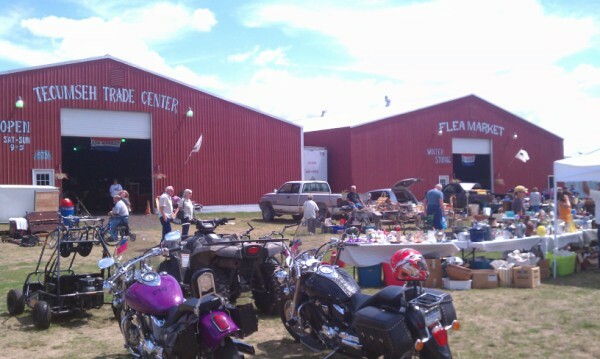 We host carnivals, bike meets and auctions within the 4.5 acres outside. Open May through October 15th!